Equipped with the latest technologies, Atlanta Vision Institute is greater-Atlanta’s preferred center for vision correction surgeries. We are led by our skilled ophthalmologist, Dr. Ashraf, who has performed tens of thousands of successful laser eye surgeries and prides himself on always being at the forefront of surgical techniques and procedures. 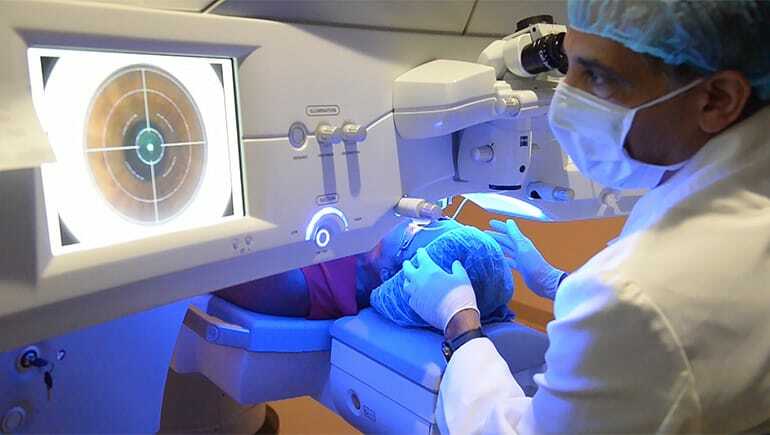 He is the first surgeon in Georgia to provide the cutting-edge 3rd generation of laser vision correction, SMILE, and the Atlanta Vision Institute team is able to handle any surgery that fits your needs. SMILE stands for small incision lenticule extraction and is approved by the U.S. FDA. This procedure is increasing in popularity and has been performed successfully on over 800,000 eyes worldwide. SMILE is gradually replacing LASIK as the go-to laser vision correction surgery, and we are proud to offer it right here, at Atlanta Vision Institute. What’s the Difference Between SMILE and LASIK? During LASIK surgery, a small flap in your corneal tissue is created so an excimer laser can reshape your cornea. With SMILE, an excimer laser is not used, and a corneal flap is not made. Instead, your surgeon uses a Femtosecond laser to reshape the cornea. The recovery for this less invasive procedure is twice as fast as LASIK and relatively effortless, meaning you can enjoy your perfect vision sooner and pain-free. Is SMILE Right for Me? Schedule a consultation with Dr. Ashraf to see how you can benefit from his advanced SMILE procedure. The procedure is done with a high-tech precision laser. Simple and takes about 6 to 8 minutes in its entirety. Recovery is a breeze, requiring minimal post-op care. Surgery is quick and easy. Most people are amazed how effortless it is. Experience substantially improved eyesight just a few hours after surgery. It is a flapless procedure that has all the combined advantages of surface ablation (PRK) and LASIK. It is PRK without pain and LASIK without a flap. SMILE is a flapless, bladeless, noiseless, odorless procedure. The entire laser procedure takes less than 30 seconds. Visual correction is performed directly to the cornea. Vision improvement is immediate, but recovery is longer and there is some discomfort. The most common and popular vision correction procedure. Quick recovery with minimal complications. Requires no flap. Cornea remains in tact. Recovery is fast and complications are rare. If you would like to learn more about the procedures and treatments offered at Atlanta Vision Institute, feel free to call or email us with your questions, or come in for a consultation. Dr. Ashraf understands the sensitivity and concerns about eye treatment, and is happy to answer all of your questions about your procedure. To schedule an appointment, call (770) 622-2488. Or, fill out our easy online form, and one of our staff members will get back with you shortly.